is a junk file junk files. these files are not useful. for example, temporary files, old files and recent file. all files must be cleaned as if the pile will be spending your hard disk space. consequently, the performance of hard disk is slow so that the effect on the performance of the computer itself. you leave at least 15% of the total capacity of your hard disk. junk files do not appear out of nowhere. when you open the application program, the program automatically create temporary files, no windows except itself. temporary file is deleted by itself automatically when the program closes. however, sometimes the temporary file with extension. TMP still left in the hard disk and not deleted. long the temporary file will fill your hard disk. you can see the temporary files by default in place in the directory C: \ windows \ temp. besides, you can see it through MS-DOS prompt with the command set picking. in windows 98 there is a tool that can automatically delete temporary files with disk cleanup. on Windows 98, you must have installed the microsoft plus! 98 because of the features of the Windows 98 disk cleanup usual incomplete. select start | programs | accesories | system tools | disk cleanup. 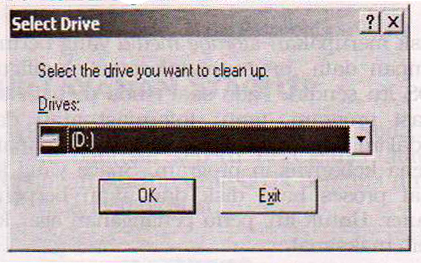 select the drive where you will do a disk cleanup, click ok to run the executable. in addition to the above method, there is no way to delete automatically when windows is started up, is to create a batch file. open the autoexec.bat file contained in the root-directory C: with notepad. in the last line, type the command: Del C: \ windows \ temp \ *. TMP. then, save the file. 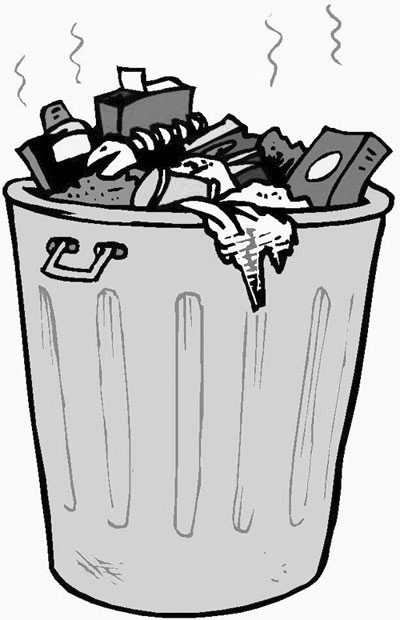 bin files with extension TMP is not just, there's more like BAK, OLD, SIK, CHK, and much more. bin file is not found only in the temp folder, but scattered across your hard disk and hard to find even to remove them. you can get around by clicking the start menu | fine | files and folders. named in the column, type the extension *. bak; *. chk; *. tmp; *. old; *. sik. look in the contents column on mycomputer, then you click find now. after the search is complete, click on one file, then delete to delete. This method only removes one by one file. to select all files, press the key combination Shift + A, then delete. to search garbage files, click the file menu | save the search. after that, will appear a new icon files named @. bak; @. tmp; @. old;. the more you often do cleaning junk files, it will affect the performance of your computer's hard disk. in addition to using this method, you can delete junk files using utility software. 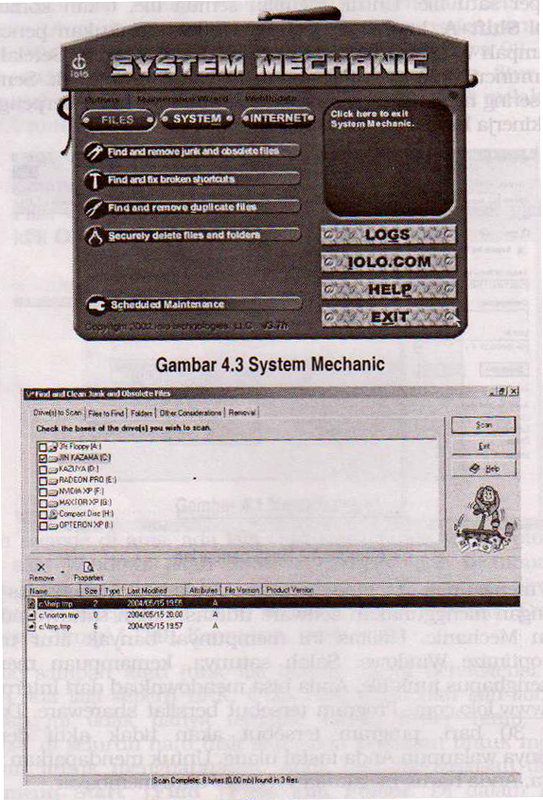 one of them is this mechanic.utilitas mempunyaibanyak system to optimize the features for windows. one of them, the ability to find and remove junk files. you can download from the internet at sites www.lolo.com. The program is shareware. within 30 days, the program will be inactive by itself even if you reinstall. to get its full version, you have to register or pay. select the start menu | system mechanic | start system mechanic, then will appear as shown below. 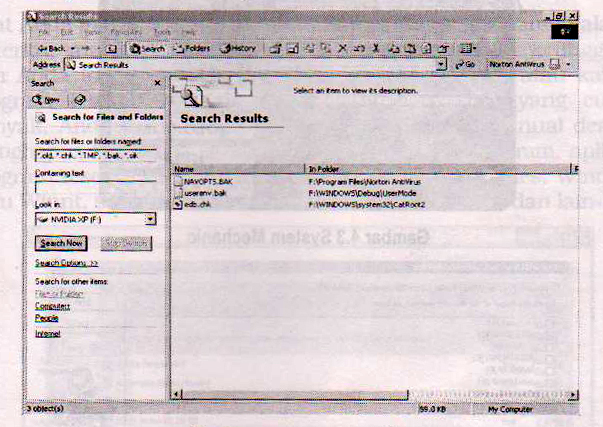 select the menu find and remove junk and obsolete files. to eliminate junk files, you first select the drive you are going to clean it. Click scan to begin the search. after the file is found, click remove all entries to remove. click yes and exit to exit.